A humanoid artificial intelligence robot became the first robot to receive a citizenship Wednesday at the Future Investment Initiative conference in Saudi Arabia, CNBC's Andrew Ross Sorkin reported. She poked fun at Hollywood for portraying negative images of robots, such as in the film "Blade Runner." The AI also took a jab at Tesla's CEO Elon Musk, who is outspoken about his belief that AI could be "a danger to the public," after avoiding to answer Sorkin's questions about robots' self-awareness. 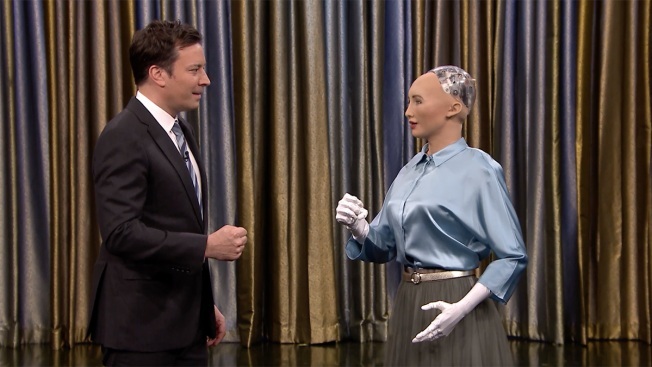 Sorkin announced to Sophia and the audience that Sophia is awarded with the first Saudi citizenship for a robot. "I am very honored and proud for this unique distinction. This is historical to be the first robot in the world to be recognized with a citizenship," Sophia said. Sophia is Hanson Robotics' most advanced robot. She was featured on the cover of Elle Brazil magazine, and she appeared on NBC's "The Tonight Show With Jimmy Fallon" in April.